Cows in the Garden . . .
Defenseless as our garden is, I expect to lose a few seeds to juncos, raspberries to robins, and greens to a marauding deer that discovered our yard last year. But cows?! The other night I was awakened at 2 am by the sound of twigs snapping and a quiet rustling outside. I thought that I would at last have a chance to confront the deer that had been munching away at our arugula and lettuce all summer. As I headed downstairs I heard a low, unmistakable “mooo-oo-o.” Cows. I ran downstairs to find four cows with their noses buried deep into our front raised bed! My husband came downstairs to find me quietly trying to shoo them in a way that wouldn’t awaken sleeping babes. He ran them off with a few well-aimed rocks to their rumps. 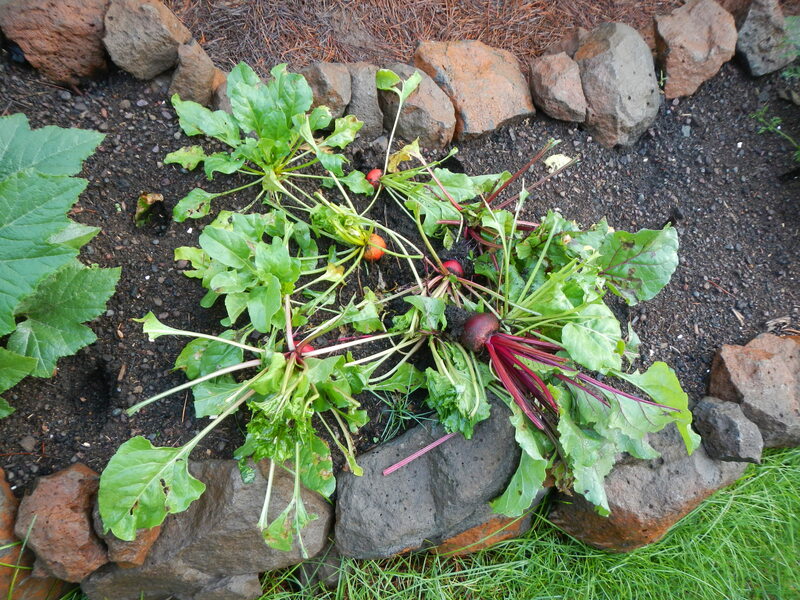 Next morning I found a patch of beets reduced to this. They had been plucked from the ground with their tops partially eaten. The roots, however, were unharmed and made for an early harvest. The flower garden took an even bigger hit, with many native plants grazed down to nubbins. The cows either entered town from the north, across Highway 36, or from Mountain Meadows, where unmaintained fencelines enable cattle to reach the lakeshore and from there perhaps make their way into town. So ranchers, if you’re missing a few head of cattle, you might want to try cruising through Westwood to locate your strays. In fact, please do come and collect them before they wreak any more havoc in our yard! Forget breakfast in bed or a restaurant brunch. 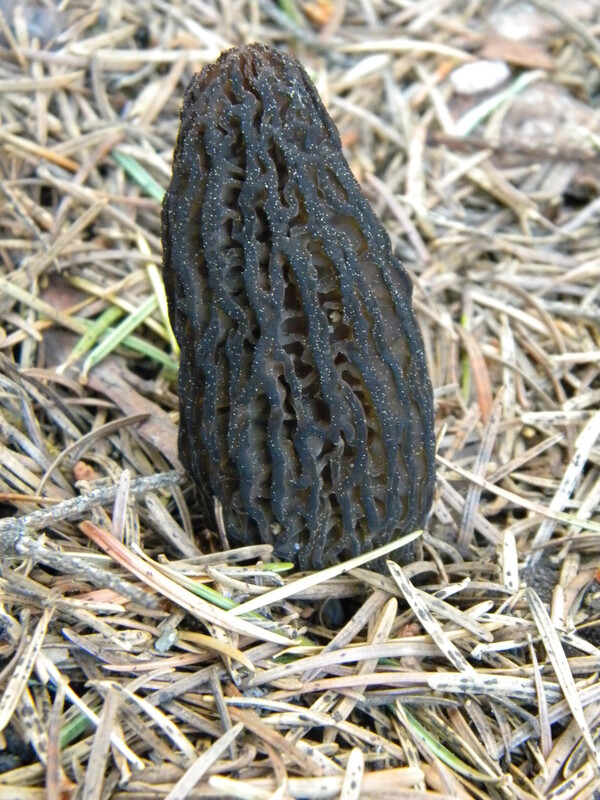 My husband, who knows me so well, organized instead a multi-family morel-hunting expedition to celebrate Mother’s Day. Location? Well now, I’m not going to reveal that. All I will say is that we went to an area that burned in a wildfire last summer. We were capitalizing upon the tendancy of morels to fruit prolifically the season that follows a fire event. 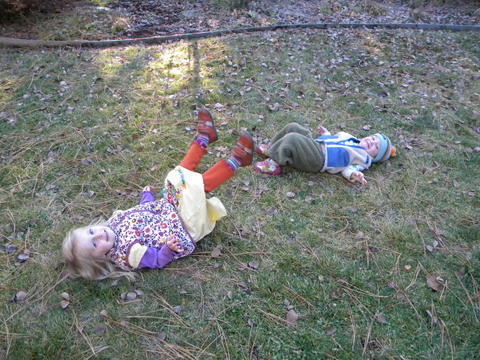 The girls eagerly joined the hunt, although they have soundly rejected the taste of morels in the past. M. in particular was tireless in her pursuit, scrambling up steep, slippery, needle-covered slopes and scanning the forest floor for these tricky little fungi. Morels were well-camouflaged among pine cones and bits of charred wood, but we brought in quite a haul. We are novices to morel preservation, but found that online advice convened around keeping the fungi well-aerated while drying. We strung up our catch in a ventilated greenhouse, hoping to enjoy our morels for months to come. I love to split wood. This is a recently acquired skill. Growing up, turning on the heat meant the flick of a dial. But here, it means coaxing a fire from the wood my husband has located, cut, marked to length, bucked, hauled home, dried, split and stacked. 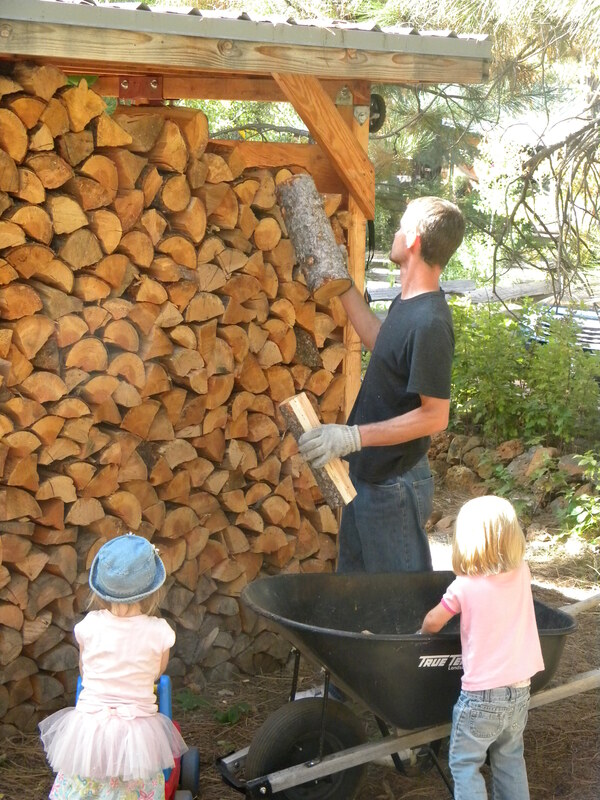 I dove into the woodsplitting game with gusto seven years ago, wielding a maul with much enthusiasm but little skill or strength. I was much more of a menace to myself than to the stubborn rounds of wood that I hacked into ragged chunks. Then I took a long break from the axe during two pregnancies and time spent tending children while my husband shouldered the task of prepping us for winter. Though unseasonably warm temperatures these past few weeks make it easy to forget the imminence of winter snows, the equinox does not lie. We spent the weekend preparing for winter. I was out there, splitting maul in hand. I love the thwack and pop of an arc that has hit its mark. I found, to my surprise, that the maul did not feel as heavy as in year’s past. I could lift it over my head with ease. I think I have my daughters to thank for this, the four years that my arms have cradled and lifted these babies turned toddlers. A splitting maul is nothing compared with countless trips shuttling these young ones up and down stairs! And I appreciate the chance to contribute to a task that can be measured in neatly stacked rows. So much household work is effaced in days if not minutes. The clean kitchen dissolves into chaos. Entropy dances across freshly swept floors. But then there is the work of a knit mitten, or a row of wood. These are tangible evidence of time well-spent, working to ensure our family’s warmth in the months to come. These past two weeks, I have watched summer plans vanish in a column of smoke. Or three columns, to be more precise. Twenty miles to the northwest, the Reading Fire sprawls across forty square miles in Lassen Volcanic National Park and the Lassen National Forest. Thirteen miles to the southwest, the massive Chips fire (at nearly 70 square miles) presses toward Lake Almanor and is the source of thick, choking smoke. The Mill Fire, thirty miles west, above Mill Creek, is not sending smoke our way, but does have the unfortunate effect of drawing my husband into 16-hour days away from home. 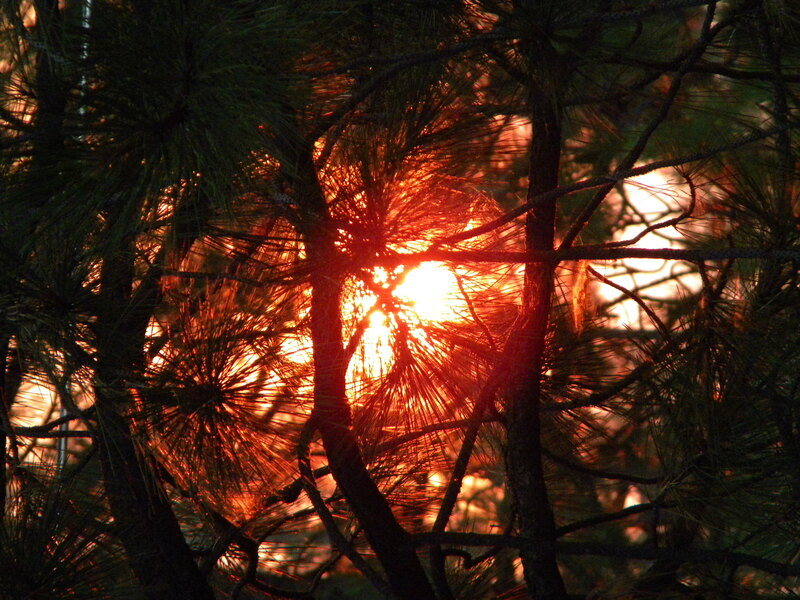 Occasional clear mornings feel like a gift, a brief respite, but by late afternoon charred pine needles again sift down from the sky. Field season is over, camping plans postponed, trips to the lake not an option. We hunker down inside, but can’t help ourselves from flinging the windows wide open when the heat becomes too stifling. 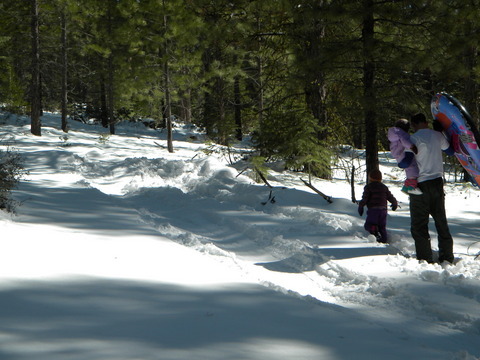 Last weekend was our first and perhaps last true snow playday of the season. Five sleds + seven kids + eight adults on a mellow slope down Goodrich Mountain that became faster and faster with each subsequent run. At first adults held kids squarely on laps. But once the hot chocolate and snacks came out and adults got to gabbing, the kids took charge, hoisting sleds up the hill themselves and sailing down in different permutations. M’s choice partner was a fellow four-year-old. They sang “What’s gonna work — teamwork!” as they trudged uphill together holding the sled between them. Of course there were many wipe-outs (that’s all the fun, right? ), and a few kids were taken out like bowling pins when they crossed the track at the wrong time, but I don’t think a single tear was shed, they were having so much fun. Mark your calendars! See flyer here. I am so very excited! 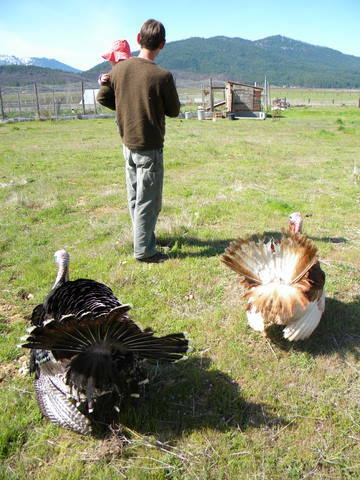 Trail’s End Farm, who frequents the Susanville Farmers’ Market, has been running a CSA (Community Supported Agriculture) program out of Susanville for the last few years. 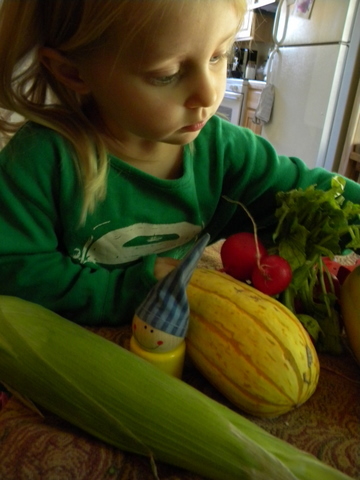 CSA subscribers pick up weekly deliveries of fresh, seasonal produce from the farm. And for the 2012 season, they are considering a Westwood drop-off! This is fabulous news indeed. Since I drive across the pass to Susanville so often for work, I rarely make the extra trip to the Saturday farmers market. But here is M. last fall with a haul from one of those rare trips — much of this is, I believe, from Trails End. Delicious stuff! I am encouraging other Westwood residents to take a peek at the Trail’s End website and consider joining as well — a healthful, economical, local choice for good summer eats. Last Saturday we walked to downtown Westwood for the 3rd annual Chowder Cookoff. Like any winter event here, this one usually involves significant snow cover, but this year was warm and sunny. For the adults, chowders, oysters, fried okra and hush puppies. For the kids, a bounce house and face painting. For all, a bluegrass band. I was also excited to pick up a few jellies made from locally foraged fruits. Don’t they look beautiful in the sunlight? 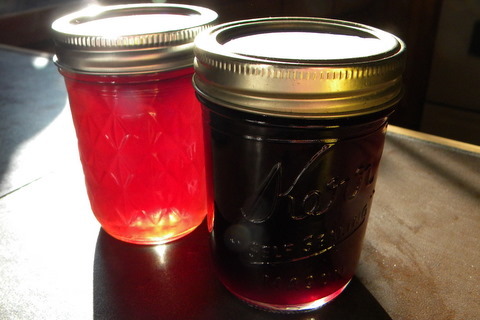 The jar on the left holds Sierra gooseberry jelly (Ribes roezlii), and the jar on the right is elderberry jelly (Sambucus nigra). Tonight is the annual Westwood “Christmas in the Mountains” tree lighting ceremony. Historically, this event feels like the beginning of our mountain winter as snow crunches underfoot, we warm ourselves by small bonfires, sip on cocoa, and watch the lights glow. But this year, the snow has dawdled and the sun shines boldly. The girls and I haven’t been outside much this past week. We arrive home in late afternoon just as the sun sets. So today solid outdoor time was an absolute priority. Skiing can wait. For now, I am drinking in this borrowed sun and reveling in a lawn still available for play. Our friends at Avalanche Ranch in Indian Valley passed along this link to the Northeastern California 2010 Food and Agriculture Guide (left sidebar, produced by Plumas Rural Services). This brochure contains a map of farms and ranches in Indian, Sierra, American, and Honey Lake Valleys that sell direct to customers, at local Farmer’s Markets, or to local stores. I will post this link on the resources page as well — access to fresh, local meats and produce is a valuable resource indeed! Looking at this brochure, I am excited to see just how many choices we have in our area. Good food, support for local economies, no middleman. Locavores rejoice!